Curcuma zedoaria, zedoary, white turmeric or kentjur, (known as కచొరము kacōramu in Telugu) is the name for a perennial herb and member of the genus Curcuma, family Zingiberaceae. The plant is native to India and Indonesia but now naturalized in other places including the US State of Florida. It was introduced to Europe by Arabs around the sixth century, but its use as a spice in the West today is extremely rare, having been replaced by ginger. 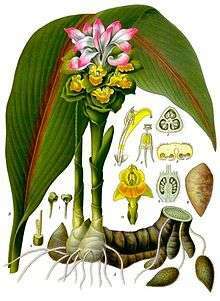 Zedoary is a rhizome that grows in tropical and subtropical wet forest regions. The fragrant plant bears yellow flowers with red and green bracts and the underground stem section is large and tuberous with numerous branches. The leaf shoots of the zedoary are long and can reach 1 meter (3 feet) in height. The edible root of zedoary has a white interior and a fragrance reminiscent of mango; however, its flavour is more similar to ginger, except with a very bitter aftertaste. In Indonesia, it is ground to a powder and added to curry pastes, whereas in India, it tends to be used fresh or in pickling. In Thai cuisine it is used raw and cut in thin strips in certain Thai salads. It can also be served cut into thin slices together with other herbs and vegetables with certain types of nam phrik (Thai chilli pastes). The essential oil produced from the dried roots of Curcuma zedoaria is used in perfumery and soap fabrication, as well as an ingredient in bitter tonics. The curcuminoid 1,7-bis(4-hydroxyphenyl)-1,4,6-heptatrien-3-one, and the sesquiterpenes procurcumenol and epiprocurcumenol can be found in C. zedoaria. Wikimedia Commons has media related to Curcuma zedoaria.